Talking and thinking about how to help children celebrate diversity during the holidays in early childhood programs can be challenging to adults. There is an increasing diversity of children, families, and staff who make up our programs. Each may have different ideas of how to celebrate holidays. We have the responsibility to meet both the intellectual and social needs of the children with whom we work. How we meet those needs also applies to how we include holidays in our curriculum. Even for adults, the concept of holidays may not be as simple as it seemed when we were young. Working through these issues is important for ourselves, the children, families, and communities in which we live and work. Many people use holidays to teach children about other cultures. In her book, Anti-Bias Curriculum: Tools for Empowering Young Children, Louise Derman-Sparks talks about the problems of using this type of approach with young children and points out the dangers of using what she calls a “tourist curriculum.” If holidays, with their traditions, foods, and activities, are the only things we teach children about other cultures, we aren’t really communicating a true picture of that culture. Incorporate aspects of those other cultures throughout the day and the year, not just on one holiday. Consider experiences from the point of view of children in your program. If the children do celebrate holidays differently, perhaps because they are of different religions or cultures, you can build on their knowledge of each other. The lesson that a friend celebrates different holidays, or the same holiday in a different way, and is still a friend, is the most important lesson for appreciating differences. It is the concept that difference does not mean better or worse. If, on the other hand, all the children in your program celebrate holidays in similar ways, give careful consideration as to how you introduce holidays from other cultures. You don’t want to teach incorrect information (historically or currently inaccurate) or misinterpret a culture or religion with which you are unfamiliar. Educate yourself about other cultures. Ask for assistance from your local library. You might look for children’s books on another culture, as well as books geared to adults. Examine your own understanding and knowledge of the culture. As children live and play with each other, they express ideas about each other. While different cultures may not be evident, you may hear comments about different abilities of boys and girls. There may differences in ethnicity and culture that children will comment on, too. These realities for children are a valid starting point. Responding to children’s thoughts and ideas as they occur and gently introducing new ones is a challenge to all who work with young children. It is what makes your work a profession – not just a job. As teachers, we believe our actions have deep and lasting effects on children in their cognitive development. We must acknowledge that our actions – and perhaps unconscious messages – also have deep and lasting effects on children’s social and emotional development. Helping young children learn about diversity is an important role for child care providers. Teaching inclusiveness needs to be a conscious and deliberate effort by adults. Diversity is not taught during a single day or activity. Respect for all people is a concept that should be woven into all activities and lessons, from reading to art, and from singing to pretend play. Avoid a focus on teaching young children specific, isolated facts about different cultures. Children may become confused or frustrated with too much specific information because they do not understand the context of time and faraway places. Instead, use activities that will expose children to new concepts and allow them to experiment with different materials. Incorporate materials from a variety of cultures into your library, dramatic play area, puzzles, and other learning materials. It is important to extend lessons in diversity to include concepts such as respecting differences, being inclusive, and appreciating others just the way they are. Go to your local library and ask for children’s books that depict children of all abilities. Build activities from these books and encourage the children to make them part of their free and dramatic play. Remember that children learn respect and acceptance from the adults around them, so model the valuing of different cultures in your interactions with children. When working with children in child care, be sure to emphasize the acceptance and value of every person of all backgrounds. Help children identify some common bonds that children of all cultures share, such as family, foods, music, languages, and art. Point out these similarities, and use them as a basis to teach about ways that people are similar and different. Families are a great resource for teaching about cultural similarities and differences. Post photos of each child with his or her family. Encourage children to talk about their own families and traditions and to compare family traditions around meals, holidays, and other activities. You can even invite families to come speak to the children in your class about their culture and traditions. Educators should recognize, respect, and celebrate diversity all year round, regardless of the season. December is obviously a special month because it is the heart of the “holiday season,” when many religious and cultural festivals are observed. 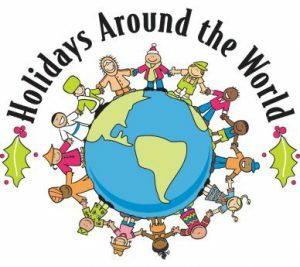 And so it is during December that many teachers take time to invite students to share their own family’s holiday traditions, as well as to learn about other people’s traditions, whether they are on the other side of town or the other side of the world. What we find among the many diverse customs, regardless of religion or culture, is that the holidays are a time for giving and sharing with the ones we love, as well as with those less fortunate than ourselves. This is an important message to discuss with children of all ages. And while many people think of the holidays as a time for decorations and partying, it is also a sacred and holy time for many people, and a time for observing age-old traditions that have been passed down for generations. Again, these are topics worth discussing with children. And whether you work in a secular or faith-based child care setting, there is benefit in promoting the basic theme at the heart of all December holiday traditions: love. That’s something that strikes each one of us in the same way, no matter who we are or where we are from.